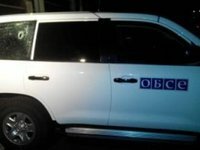 Illegal armed formations did not allow the observers of the OSCE Special Monitoring Mission (SMM) into the village of Verkhnioshyrokovske of Novoazovsky region and the village of Yuzhna Lomuvatka of the Briankivsky Town Council of Luhansk region to carry out monitoring. "Systematic obstacles by the armed forces of the Russian Federation regarding the activities of international observers continue. In accordance with the OSCE SMM report published on October 10, 2018, the militants prohibited the Mission from traveling to Verkhnioshyrokovske and Yuzhna Lomuvatka for monitoring," the Joint Forces Operation (JFO) said on Facebook on Thursday. Also, according to the OSCE SMM, the Mission's unmanned aerial vehicle recorded six firing positions and construction of a militant dugout in the village of Zolote-5, two of which are located near the houses of local residents, as well as new trenches with a total length of up to 100 meters. "The armed forces of the Russian Federation continue arranging fortifications within the settlements, which causes a huge threat to the lives of civilians," the message says.